Wonderful treasure to add to your dollhouse! 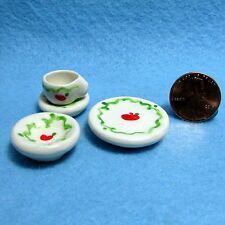 4 Piece place setting in an apple design for your dollhouse. Apple Dish Set. Hand crafted. Hand crafted Cannister an apple design. Wonderful treasure to add to your dollhouse! Perfect for any counter top display. Hand crafted tureen with ladle in a sunflower design. Tureen and Ladle. Wonderful treasure to add to your dollhouse! 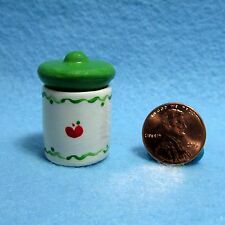 Very cute for the table in your dollhouse. All 1" scale. Stand for Candlesticks Approx. 2 Sets of Silverware (To Scale). 1 1/4" H (larger teapot). Tea Set - 5 pieces. with light wear due to age;. 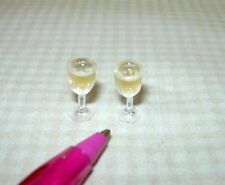 I made them to put with my kitchen displays, but I also thought they would be perfect as dollhouse miniatures! I thought it would be fun to make miniature kitchen canisters to match my miniature Pyrex inspired bowls! LOT 5 MIXED MINIATURE WOOD 1 COKE BOTTLE, 1 WINE BOTTLE JUG, 2 GLASSES AND 1 VASE. GREAT FOR DOLLHOUSE/BUILDING SETS/CRAFTS OF ALL KINDS. Jars for Flour, Sugar, Tea, Salt & Pepper Shaker. Made of wood. Handmade and hand painted. Use zoom function for more details. Pictured is the item you will receive. Item is in pre-loved condition and may need a better cleaning. These do not match. They are all. The pots and teapot is a lighter blue than the canister, cup, bowl, and plate. Beautiful 18 PC. Solid Brass Dollhouse Miniatures. 1 Pitcher with Lid. 1 Tea Kettle with Lid. 2 Coffee pots. 1 Bean Pot with Wire Handle. 1 Bean Pot with Side Handles. 1 Mortar with Pestle. DOLLHOUSE MINIATURE. COOKING POT. 3/4" h x 1 1/2" w x 2 1/2" from pot to handle. I NOTE ANY FLAWS I MIGHT FIND AND TRY NOT TO MISS ANY. MOST STUFF IS EITHER NEW OR GENTLY USED AS NOTED. I DO MY BEST TO TAKE MANY PICTURES SO YOU CAN SEE WHAT YOU ARE BUYING. This is a veryBeautiful Brown Multi-colored Clay Miniature Pitcher/Vase. This vase is handmade and handpainted and labeled Hairpin Turn-Mohawk Trail on the front. This is a great piece for your dollhouse collection! Gumball / Candy Jar. Wonderful treasure to add to your dollhouse! This sale is for a dollhouse miniature Silver Napkin Ring from the 1980s. 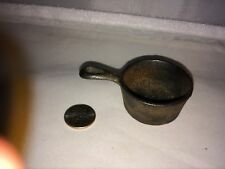 Unmarked but appears to be Artisan-made of Silver. Excellent condition. It was quite tarnished when found. I polished it to help find a mark but was unable to identify the maker. Make Supersized Seem Small. Get Images that. Could be German made, but has no Markings. Wash Bowl Pitcher Set Pennsylvania Souvenir Miniature Strasburg Railroad Rd. Beautiful Ceramic Miniature Water Pitcher and Wash Bowl. On the side of this Pitcher Is a Moving Train and lettering that says. for a Doll House. There are 2 small marks on the handle of the pitcher. A relative of mine collected these Dollhouse miniatures back in the 1970's. I have tried to explain the details of each as best as possible. For your consideration:10 pc TEA SET, white with gold detail. 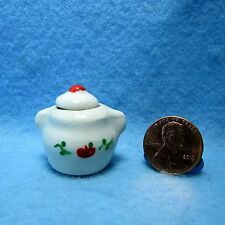 Doll house miniatures tea set. Ivory color. Made in 1984. 3" H (teapot). Tea Set - 10 pieces. with light wear due to age;. This pie plate is a must for the kitchen. Heralding the taste of hot apple pie. You can make a top with your favorite pie or just have to the side as a decoration.